information is beautiful What Makes A Good Data Visualization? Hi there. I’m David McCandless, creator of this site and author of two infographic mega-tomes, Information is Beautiful (2009) and Knowledge is Beautiful (2014). I’ve created a lot of data and information visualizations. Around 540 over six years. (An eye-bleeding, marriage-crumpling average of 1.7 per week). There are 196 in my new book, Knowledge is Beautiful (out now). Yes I sometimes have dataviz dreams. 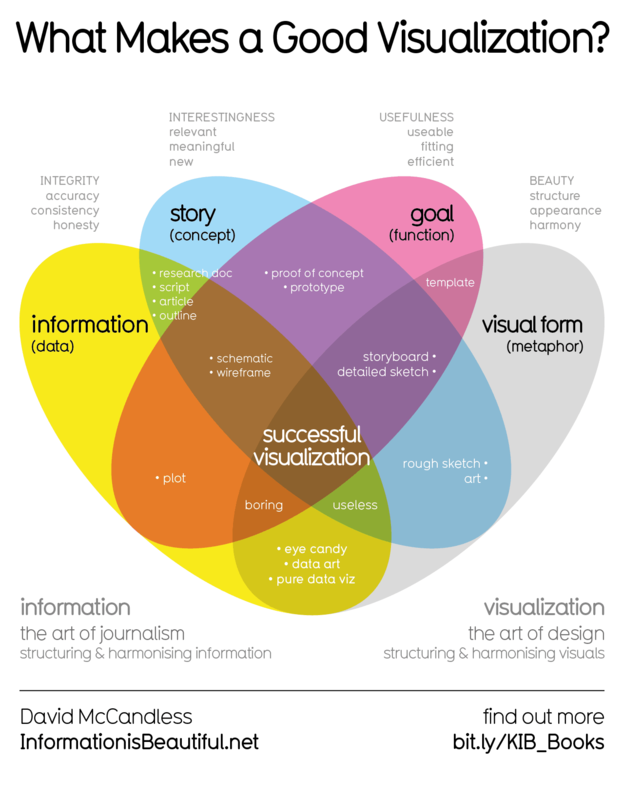 This graphic visualises the four elements I think are necessary for a successful “good” visualization. i.e. one that works. These elements form the backbone of my process and also what I teach in my dataviz workshops. I’m not really a follow-this-system type of person. But this is just me thinking aloud in visuals. Let me know your thoughts and reflections. Email or comment below.